Beginning from iOS 10, iPhone and iPad allows several native Apple apps that always come with all iOS devices to be deleted and removed. For example, Maps, Mail, Calculator, Watch, FaceTime, Compass, Calendar, Notes, Voice Memos, Tips, Podcasts, Stocks, Contacts, Reminders, Weather, Apple Music, TV, iTunes Store and etc. By allowing default native apps to be removed and deleted, iOS device owners who own or prefer another third-party apps to perform the similar functions need not keep two potentially duplicate apps. It also provides a way to update those apps regularly instead of only during major software update. However, if you accidentally delete any of default apps, or want to reinstall the native apps again, or some third party apps that always require to open only default Apple apps, you should know where to find them. 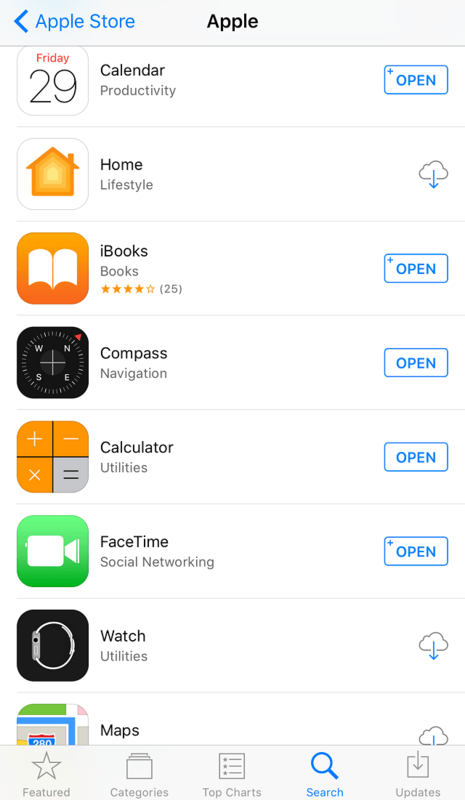 You can find all apps the originally installed on iPhone and iPad in the App Store. You can simply go to “Search” tab to find the app (these apps will be labeled by Apple), and then tap on the “Cloud Download” icon to install it. The native apps won’t come back by just resetting the Home Screen.